Lafarge Cement Factory at Al-Fuhais (Jordan) was marked of having some energy issues which required performing site visits for defining, locating and gathering any required information related to the energy issue. Considerable amounts of waste energy were detected in exhaust gases. Moving a light spot into the exhaust gases led to quantify their available heat content and then to look for an implementation for the recovered expelled energy. Among many alternatives, electricity generation was chosen by introducing an Organic Rankine Cycle (ORC) as an intermediary system between the hot exhaust gases and ambient. The operating conditions for the ORC were optimized to capture the expelled energy. For the selected working fluid (refrigerant R-123), the efficiency of ORC was found to be 14.45%. The recovered energy was found monthly varying in range of [239.9, 271.6] MW.hr, this represents only 2.66 – 3% of factory's electricity consumption. Cost saving of 500,000 $ (2.82%) from the annually total amount spent on electricity was attained. Heat, Energy, Organic Rankine Cycle (ORC). • Using the exhaust gases in any production process where heat is a key role saves the costs of cooling and filtering of exhaust gases before discharging them into the atmosphere. • Generating electricity (for example) from the recovered waste heat would shrink the electricity bill. The more the electricity generated from waste heat source the greater the shrinkage in electricity bill. • Waste heat recovery prevents harming the environment by lowering the high temperatures of exhaust gases. This project is meant to look for an opportunity of being more efficient in energy usage. Once found, the trend was to optimize the operation conditions for various components of WHR unit to recover the maximum amount of expelled energy without designing or selecting them individually. Lafarge cement factory in Al-Fuhais is one of the main cement factories in Jordan and fortunately it has waste heat issue with increasing in production due to increasing demand. This encourages the consideration of moving Lafarge factory into a light spot to study the possibility of recovering its waste heat and converting it to a more usable form of energy. This requires a clear well thoughtful plan to understand, analyze and solve the waste heat issue in the best way. The following are the procedures which were taken and implemented to reach to the best results (Figure 1). Figure 1: Implemented project procedure. Defining and locating the energy issue, then gathering the required data (Figure 2). Figure 2: Factory layout with principal processes data. Once all energy uses have been identified and quantified, analysis begins to estimate the amount of heat content in exhaust gases being discharged in order to determine the available energy that can be recovered, since energy is a system-environment property, it is necessary to consider the geographical location and weather data of factory while calculating the available energy (Figures 3 and 4). 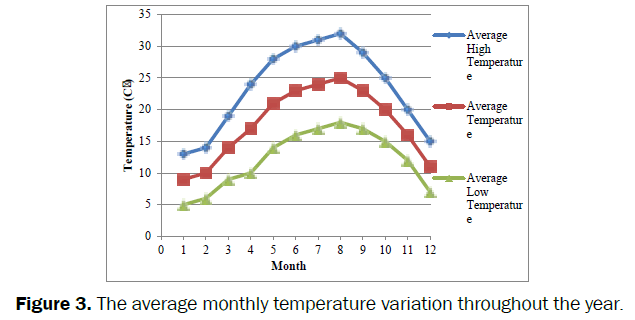 Figure 3: The average monthly temperature variation throughout the year. 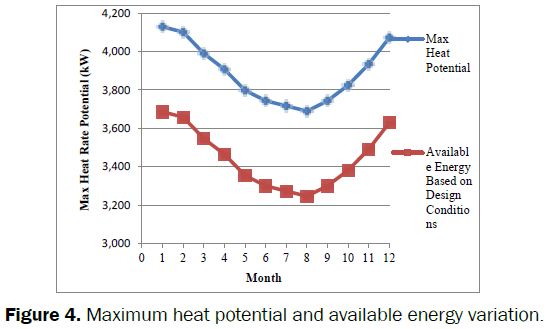 Figure 4: Maximum heat potential and available energy variation. After specifying the amount of recovered energy from waste exhaust gases, it is necessary now to look for an implementation to utilize the available recovered energy in-hand. Employing this recovered energy in serving factory needs could be implemented through different waste heat recovery methods. Electricity generating using Organic Rankine Cycle (ORC) instead of using Steam Rankine Cycle or Kalina Cycle because the conditions of factory waste heat and factory requirements are all met in ORC features. This makes choosing ORC for waste heat recovery become much reasonable since ORC features tend to be the most optimized alternative. The layout of the factory after introducing the ORC is shown in the following Figure 5. Figure 5: Factory layout after introducing ORC. Analyses were made to find the best performance of ORC, and the working fluids have been selected from ASHRAE standard-34  and classified as given by ASHRAE Safety classification  (Table 1). Table 1: ASHRAE safety classification. • The lower pressure (condenser pressure) is selected to maintain the working fluid saturated temperature at 7°C above the maximum ambient temperature in summer (August). • The upper pressure (heat exchanger pressure) was varied below the critical pressure of each fluid. • The optimum upper pressure of each refrigerant is selected where the highest thermal efficiency and network output is obtained taking into consideration being 20°C below the fluid critical temperature at the turbine inlet. Finally, the screening criteria of the best operation conditions for the ORC are found by selecting the maximum thermal efficiency, maximum net power output and maximum second law efficiency after comparing the optimum operations of the working fluids (Figure 6). 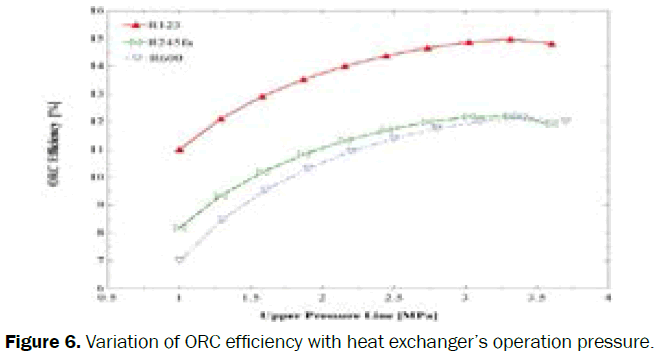 Figure 6: Variation of ORC efficiency with heat exchanger’s operation pressure. To maintain this cycle operating at constant efficiency, the working fluid mass flow rate has to be controlled. Controlling the mass flow rate depends upon the heat input to avoid superheating or high quality saturation mixure at the turbine inlet. Figure 7: The power that can be delivered per month. Using R-123 for ORC, the minimum and maximum amounts of heat that can be recovered is shown in Figure 8. In order to utilize this recovered waste heat, they are visualized in Figure 9 as percentages of the factory electricity consumption which is nearly 9 GW.hr monthly. Figure 8: Minimum and maximum amounts of heat that can be recovered. Figure 9: Visualization of minimum and maximum amounts of saving. Notice that the savings are depending on the recovered energy which varies every month. 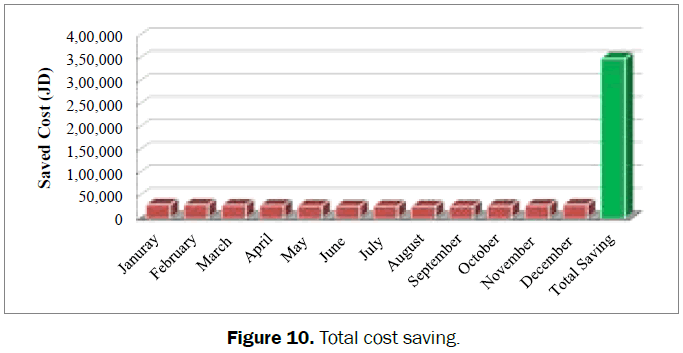 The same procedure was used for the rest of year months as the following Figure 10 shows the total savings was found to be 350,000 JD per year. Figure 10: Total cost saving. The installation cost for ORC is in range from [2000, 4000] $ per kW produced .By taking the upper limit 4000 $ / kW, the installation cost for a power output of 450 kW is (1,278,000) $. The payback period for this investment would be (3 years and 8 months). • Any source of any form of waste energy is not necessarily being non-useful anymore. Interesting amounts of energy contents may be found in waste energy sources especially when confronting elevated temperatures, high vibrations or huge flow rates. • Even if the recovered energy from the waste energy source seems to be small, it still holds the name of energy. One of auxiliary equipment’s can be driven and/or energy usage of some sectors can be covered by the recovered energy. • Any source of waste energy has its inherent conditions of form of energy being wasted. Also, it must be assured that the recovery method fits the conditions of waste energy source and can convert the form of energy being wasted into more desirable form. As seen in this study, ORC is applicable at the temperature range of exhaust gases and fulfill the requirement of converting the waste heat into electricity. • Bounded by many factors imposed by the conditions of exhaust gases and ambient, optimization of ORC operation conditions to get maximum work output within some boundaries is depending upon the working fluid being used. Selection of working fluid depends upon its thermodynamic and critical point properties. Although the electricity generated from the recovered energy looks tiny when compared to factory's total electricity consumption, it is very profitable and useful. This small portion is large enough when compared to factory's massive electricity consumption. The same applies for costs being saved; saving a small fraction from huge amount of money yields large enough savings. IFC, Waste Heat Recovery for the Cement Sector, Market and Supplier Analysis, International Finance Corporation (World Bank Droup), Instotute for Industrial Productivity, 2014. Thermophysical Properties of Refrigerants, ASHRAE Handbook – Fundamentals Chapter 30, American Society of Heating, Refrigerating and Air-Conditioning Engineers (ASHRAE Standards Committee), 2009. Designation and Safety Classification of Refrigerants, American Society of Heating, Refrigerating and Air-Conditioning Engineers (ASHRAE Standards Committee), Atlanta 2008. Nouman J. Per Lundqvist, Comparative studies and analyses of working fluids for Organic Rankine Cycles – ORC, KTH School of Industrial Engineering and Management, Master of Science Thesis EGI-2012-086MSC, STOCKHOLM 2012. Roos CJ. 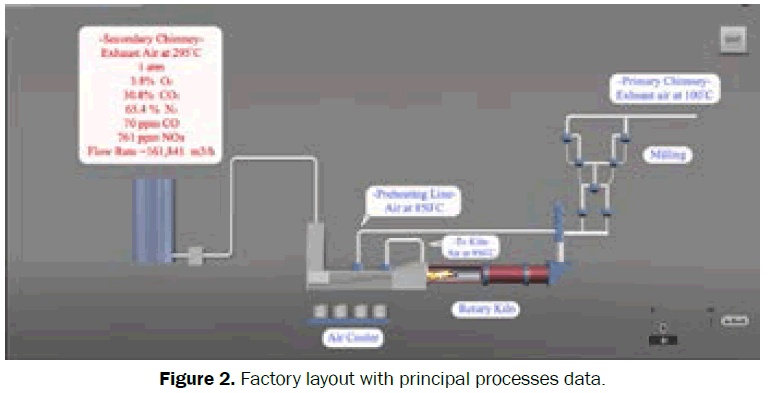 An Overview of Industrial Waste Heat Recovery Technologies for Moderate Temperatures Less Than 1000ºF, Washington State University Extension Energy Program, WSUEEP09-26 2013.